Daily Illuminator: Get In The Game Faster, With Classic GURPS Templates! October 4, 2014: Get In The Game Faster, With Classic GURPS Templates! Templates are a great way to get into GURPS quicker and easier than you thought possible. Pick a profession and a few some options, and then bash bad guys or skulk in an alleyway! Two more classic collections of templates are available now from Warehouse 23: GURPS Classic: Warriors and GURPS Classic: Rogues. Each guide includes a range of possible roles from past, present, and future genres. 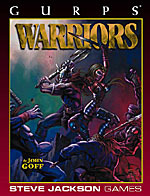 Peruse the pages of Warriors and select from such concepts as mecha pilot, barbarian, sharpshooter, and aviator. 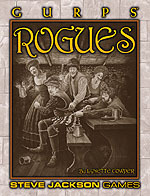 Or casually sneak through Rogues and start a career as a spy, pirate, mobster, or even mad scientist! Each template offers four ready-to-use characters, plus background and insight into each role. Although designed for GURPS Third Edition, each supplement is a perfect complement to GURPS Template Toolkit 1: Characters, the ultimate Fourth Edition guide to designing templates. Use the suggestions from that supplement to import the options from Warriors, Rogues, or GURPS Classic: Wizards. Adventure awaits; pick a role and go!